NI ROCKS Recommends "By Hook Or By Crook" by SHOTGUN RODEO. 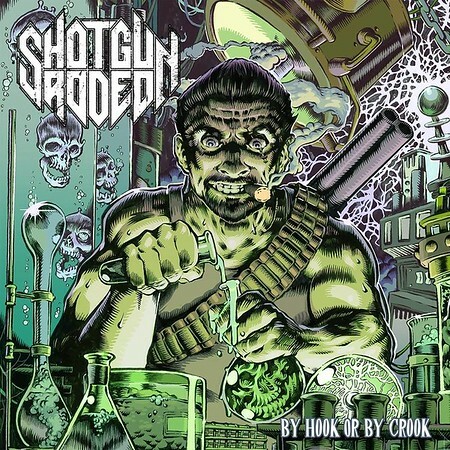 “By Hook Or By Crook” is the second full length album from Norwegian metal band Shotgun Rodeo and it was released on 24th August by Mighty Music. It’s a little heavier than a lot of the other albums that I’ve posted recommendations for recently, but the band have a distinctive sound that appeals to me! I included the excellent track “Tony Iommi” on the Friday NI Rocks Show on 20th July. Shotgun Rodeo formed in Trondheim, Norway in 2008 and released their debut EP “Dead End Massacre” in 2012, followed by “Guilty As Charged” in 2013. The debut full-length album “World Wide Genocide” followed in 2015. Another EP, “The New Standard” was released in 2016. There were a number of line-up changes during the early years, particularly in the lead vocalist role before things settled down. The band members tend to use a series of unusual stage names; making tracking the band line-up more difficult. However, according to the press release Shotgun Rodeo are Nino Escopeta on vocals, founding member Don Shrediablo on guitar, Grimmo D.B. on bass and Doomfang on drums.